A trained ethnographer and author of Start With Why: How Great Leaders Inspire Everyone to Take Action, Sinek has held a life-long curiosity for why people and organizations do the things they do. Fascinated by the leaders and companies that make the greatest impact in the world, those with the capacity to inspire, he has discovered some remarkable patterns of how they think, act and communicate. He has devoted his life to sharing his thinking in order to help other leaders and organizations inspire action. He is best known for discovering the Golden Circle and popularizing the concept of Why, the purpose, cause or belief that drives every one of us. The Golden Circle is a naturally occurring pattern, grounded in the biology of human decision making, that explains why we are inspired by some people, leaders, messages and organizations over others. 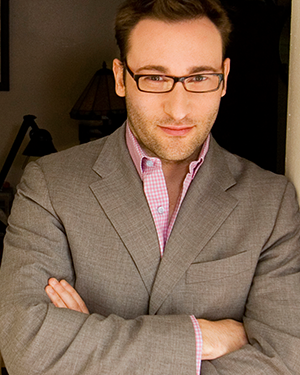 Sinek’s unconventional and innovative views on business and leadership have attracted international attention and have earned him invitations to meet with an array of leaders and organizations, including: Microsoft, MARS, SAP, Intel, 3M, the United States Military, Members of the United States Congress, multiple government agencies and entrepreneurs. Sinek has also had the honor of presenting his ideas to the Ambassadors of Bahrain and Iraq, at the United Nations and to the senior leadership of the United States Air Force. Sinek shares his optimism with all who will listen. He speaks around the globe and has commented for local and national press, including The New York Times, Wall Street Journal, The Washington Post, Houston Chronicle, FastCompany, CMO Magazine, NPR and BusinessWeek. Sinek is a regular contributor to The Huffington Post, writes his own blog, simonsinek.com and makes regular guest appearances on MSNBC’s Your Business, among others. Sinek is an adjunct staff member of the RAND Corporation, one of the most highly regarded think tanks in the world. He is also active in the arts and not-for-profit world, working with Education for Employment Foundation to help create opportunities for young men and women in the Middle East region. When not in hotels, he lives in New York, where he teaches graduate level strategic communications at Columbia University.